The rapper and producer surprised the music world when he dropped albums FUTURE and HNDRXX in February (17), with the records making him the first artist to debut two albums at number one in consecutive weeks on the Billboard 200 chart. With the two albums, Future, 33, shares that he wanted to explore contrasting sides of his personality and admits that HNDRXX reflects more romance-related preoccupations. "I'm opening you up to where I'm at," he told Billboard. "It's about being vulnerable and not so cautious about what you say as far as your love life - if you was hurt or happy or in love." 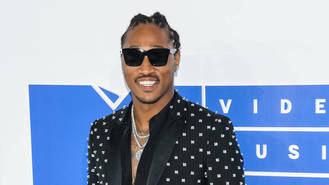 Future, real name Nayvadius DeMun Wilburn, wouldn't specify if any of the lyrics were directly related to his ill-fated relationship with singer Ciara, with whom he shares two-year-old son Future Zahir, though he insisted that he is in a good place and is focused on being a "provider" for young Future, as well as his other three children from previous relationships. "I feel like everything happened for a reason. I'm happy with life now. I'm happy with life, period, even with the end of a relationship being...," he said. "I'm just not going to settle for anything, you know? Even in my life now, I know I can be a better person." The Atlanta native explained that while he was pleased with the commercial success of his latest album drops, he tries his best not to get caught up in the hype, and he insisted he doesn't get sidetracked by the idea of awards. "The Grammys, they get what they get - the s**t that they don't, it's the s**t that they maybe don't want to understand," he added. "They're not going to keep me from doing what I'm supposed to do as an artist."